The put/call ratio is at an extreme level, about 1.3, implying a bounce soon. It is a contrary indicator such that when there are more puts than calls, like on Friday, the market is likely to rebound. And the T2108 is very low, at 16%. 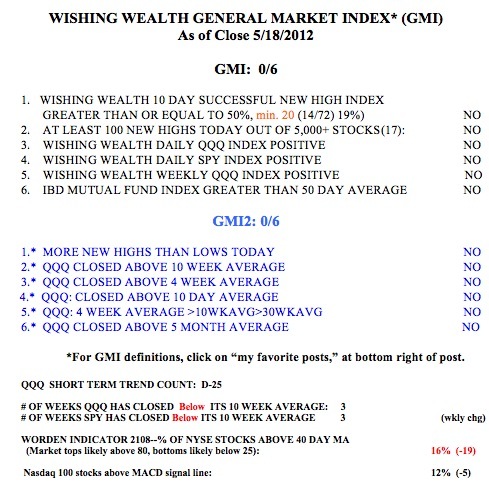 The GMI is now zero for the first time since December 15, 2011. With all of my indicators negative, is this the time to short stocks or the stock indexes? With my son’s help, I have published my first TA video post, on the current market and the infamous “Sell in May and Go Away” mantra. Let me know if you want more videos and any suggestions for making them more useful to you.View it full screen to see my charts clearly. I am your first subscriber! Love the video format. Please continue. Exited to see you using the video approach to sharing your thoughts and assessments of the market. Consider including a review of the NASDAQ Composite (and the DJ-30) as well. Your new video format is a great addition to an already great site. Thanks for taking the time to share your thoughts on the market daily. Dr Wish, since I took your class yrs ago, this presentation is one of the best things you’ve done for us. Thanks for making this video and sharing it. Thank you for your excellent video, please keep them coming. Your site is always the first one I visit pre-market. Thank you for the generous sharing of your expertise and time. Excellent analysis. I hope to see more in the future. Thanks! Great video, Doc. Very easily understood. The video and the blog in general is very educational. THANK YOU for taking the time to do it. Video was great – keep them coming. Yes, I love the added insight from the video. Thank you! Nice video Dr. Wish. I always enjoy to listen to your analysis. Thank you for the video and all the great work you do. Hoping we get a rally then another sell off with divergence of oversold indicator. This election year will be a tough one. Maybe ECRI will be right this time with their recession call. Very informative. I appreciate all that you are doing for us. Very interesting times. Dr Wish, Nice to hear your voice again. With Safari on a Mac, I could expand the video to full screen with U-Tube. The 2 shorter MAs did not stand out, (blurry). You might consider a brighter color or a wider line. Again, THANKS for your efforts and timely information. Great video, I’d love to see some more where you break down some individual stocks or analyze the DJI or NASDAQ.